There's a stock standard quote that floats around the inter-webs that simply says "no regrets, just lessons learned". The whole concept of "regret" relies on our ability to have control. Control is the very essence of regret. We can't regret experiences that were beyond our control only those that rely on our free will. As I sit here and try to think of regrets, I can safely say that of all the decisions I've made in life, I don't regret a single one. Sure there were quite a few that lacked wisdom. There are many that lacked courage. There were some that lacked foresight. But I don't regret them because those decisions have all taught me something and are a large part of who I am today. There are no regrets in my life, just lessons learned. As I watch my kids grow and make decisions I don't worry so much about them regretting the stuff that they do. I worry more about them regretting the things they don't do. Lost opportunities and experiences that may have enhanced their life. Not going on the ride at Disney because they couldn't be bothered to stand in the line; not trying out for the team because they're nervous; not speaking up if they feel somebody is being hard done by; not giving their dream one last try. Which I guess is why I continue to push so hard with my own dreams. Because I don't want to regret not having given it my best shot. There is a mantra in my house that I repeat often. "No regrets". I've realised something as I write this post this morning. I only pull out the "no regrets" phrase when someone is about to say "no". When they are going to give up on an experience or turn down an opportunity. I want them to really think about whether or not they might regret not giving it a shot. Because in my mind you can't regret having given something a try. For me regret comes not from what we have done, but what we have failed to do. What does regret mean to you? Let me leave you with some Frank Sinatra to get your week started. Nice post! Yes, I think the things we regret are the dreams we didn't fight hard enough for. Yep, I'm with you. The only things I regret are the opportunities I said no to - & I'm not even sure they're regrets. This is a good way of seeing regrets. I think sometimes I seem to regret things I didn't do, but then I question whether I truly wanted to do them or it's just a thing I think I 'should' do or because everyone else does it. This prompt certainly gets you thinking! You hit on exactly how I feel about this with so much more eloquence than I could. I always think that I will end up regretting the chances that I haven't taken more than decisions I have made and things I have done. But I feel like I make decisions with the information that I have at the time and that I try to do the best thing that I can. How can I regret that? I think the risk with encouraging others is if they see being asked about it as pressure or rational consideration over the choice. Might depend who the audience is! And how different both sets of values are. I have A STACK of regrets but I'm also conscious there's little I can do about them now other than learn from the past and move ahead taking that into consideration! I really love that first image quote. Inaction is at the basis of many people's regrets, so when I have a difficult decision to make I always try to be proactive and back myself, even if there's a chance of making a regret, at least I didn't fail to act. I've never really had regrets in life, just learning experiences. What's done is done. If you can't change it, it's time to learn from it and move on. A beautiful post, I also admire you deeply for going so hard in following both your own dreams and those of your gorgeous family. 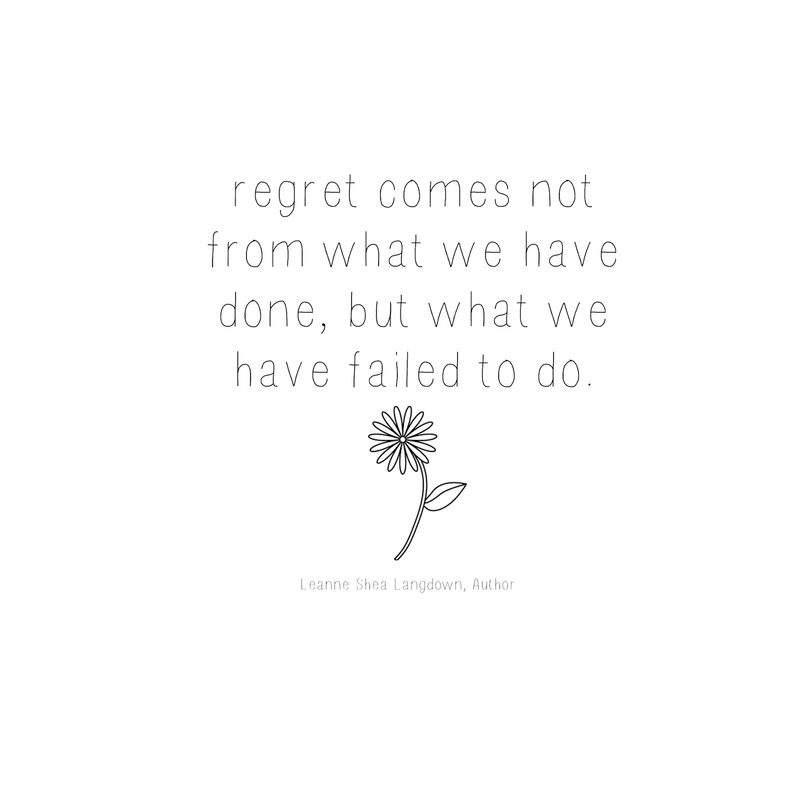 I think your "no regrets" mantra reflects who you are as a person Leanne - you seem to me to be the type of woman who will have a go and isn't afraid to take risks. That's the type of woman I'm working on being - I just have further to go! Thank you for these lovely thoughts today. There are some things in my life that I regret, but perhaps I should change them to "lessons learned". So from now on - no regrets! Thank you! Such a great way to look at life, Leanne. I admire you very much for that. Inspiring post. I didn't include Frank actually singing so I must have know you would do it!! It's a powerful song. Thank you for linking up for #lifethisweek 39/52. Next week: Letter to My 20 year old Self.